Noting the schemes and tropes helps us demystify the text and gain some measure of courage in confronting a novel that describes “times before nomenclature was”. Though it says nothing about the whole, the list is useful for a future analysis of Cormac McCarthy’s verbal techniques. I got the definition of terms from this source and Lee Jacobus’ article on the rhetoric of Milton. 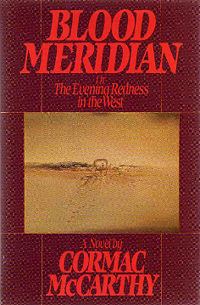 I plan to use Blood Meridian as a specimen for identifying as many rhetorical techniques as possible. Do you think McCarthy consciously goes out to fill his books with such techniques, or is it all subconscious? (my vote is for the latter). His work shows evidence of quality thinking. Who knows if intuition played a great role? Maybe it did. Once schooled in rhetorical figures, either through study or by extensive reading, which I’m sure McCarthy has done both, this kind of rhetoric starts floating to the surface both consciously and unconsciously for good authors. McCarthy is one of the best. He is and will be part of the American Literary canon along with Hemingway, Faulkner, Morrison, Emerson, etc. McCarthy is a literary king. Like Henry V he is the ruler of what is fashionable. He makes the rules. He can make new ones. He determines the new rules of his realm and craft.